​During the 2013/2014 winter, the south-west coast of England experienced an unprecedented sequence of very energetic wave conditions, including four extremely energetic and named storms. 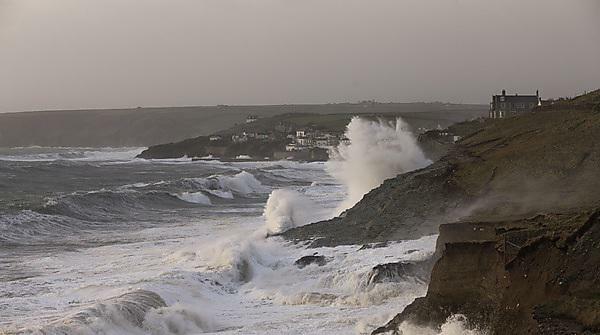 According to the Met Office, the storm Hercules on 6 January 2014 was a 1:5 to 1:10 year wave event alone, whereas the storm Petra on 5 February 2014 was probably the most damaging storm in terms of coastal impact on the south coast of Devon and Cornwall for the last 50 years. Furthermore, analysis of modelled and measured wave data shows that the eight-week sequence of storms from mid-December 2013 to 10 February 2014 represents the most energetic period of waves to have hit the south-west coast of England since 1950, and thus represents at least a 1:60 year event. The collective impact of these Atlantic storms on the southwest coast of England has been enormous and this has been made obvious by the extensive media coverage of these events. Many changes to the coastal landscape are likely to be permanent and damage to coastal infrastructure will take months and tens of millions of pounds to repair. The University of Plymouth has been awarded two prestigious NERC urgency grants in recognition of both the seriousness of the physical and socio-economic impact of these extreme events to the UK and the reputation of marine science research teams at University of Plymouth in producing internationally renowned research in the marine and coastal environment. These urgency proposals aim to assess the impacts of this sequence of extreme storms on both the physical and human coastal environment in the southwest of England, and evaluate the vulnerability of this region to such extreme Atlantic storms. The topic is timely and relevant, because the Met Office predicts that such energetic wave conditions will become more frequent in the future due to climate change. Coastal Impacts Project - impact of sequence of extreme storms during 2013/14 winter on SW coast of England. Seabed Disturbance Project - testing resilience in Marine Protected Areas using extreme storm disturbance in Lyme Bay, south-west England.